copyranter: It's a little early, but how bout a disturbing Halloween photo? When not to use Comic Sans: a funeral receipt. Hilariously bad Russian theater movie posters. It's a little early, but how bout a disturbing Halloween photo? That girl does look like Lynndie England. See more of the photographer's series here. Previously in disturbing Halloween: The Human Dickwad. 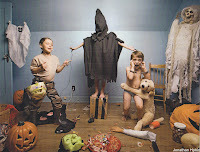 Disturbing image, involving children, that has absolutely nothing to do with Halloween. Shame on you for posting it. I don't think it's funny, and I didn't shoot the photo. Write the photographer. His website is listed at the source. No, you didn't shoot the photo. You chose, however, to make it even more popular by blogging about it. Sick Ghoul. Well, thank you for sharing your thoughts. I tried to join the Behance Network, but since I'm not a photographer/illustrator I wasn't permitted a comment. I will say after reading the photographer's statement, I find it suspect. These children are not in 'play'--at least not in any kind of play that R.Callois or J.Huizinga wrote about. These kids are posed to make statements. We've known since at least Shakespeare's Richard III that it's impossible to protect children from the 'real world'. It appears that the photographer is using children antithetically--as much as some parents wish to protect, he is co-opting their participation outside of the field of play. Play is the realm of the imagination where the real world is excluded for a time, whereas these photographs seem to drape themselves with the idea of play to cover their crass desire for perverse titillation. That said, I do think that it is worth talking about! Watching the moral outrage makes everything so much funnier. Shut up Anonymous. Some of us work as tech copywriters and have no ability to find this stuff on our own. (We can of course, if you are interested, point you to some reliable cloud computing solutions for your enterprise). I think this pic is so much fun. Anonymous : shame on you for being so narrow minded. A shame you don't find these pictures funny. I think there's a rather obvious element of humor in this (brilliant) work. Thanks for sharing. You ignorant souls... click the source and read the introduction. It explains. Ripped off from The Stranger's 2004 Halloween costume series.